The security tent was in sight, so the excitement level in the group was sky rocketing. Our queue cards were checked one last time to make sure we had not jumped the queue in the 4 hour or so long wait. Just as we were about to be allowed for security check, the 'Head' gets a call from another head (head hunter in this case) and decides that it is absolutely the perfect time to give an interview for which he gets told off by the steward. There are no left luggage facilities inside the grounds and only one bag per person upto specific size is allowed past the security check point. The husband had also pre-warned 'Thakur' that alcohol could be taken into the ground only to the equivalent of one bottle of wine/champagne or two cans of beer and 'Thakur' had used this excuse to pretty much gulp down all the cans of beer during this waiting time. Once past the security check point there is a flight of stairs, stairways to heaven if I may say so because they take you up to the bridge, across the road and into the AELTC. The entry ticket to the grounds is twenty five pounds in cash only, therefore its important to carry enough cash as you dont want to be turned away from the ticket counter after standing hours in the sun and the rain. When we entered the grounds, the play had stopped due to rain. 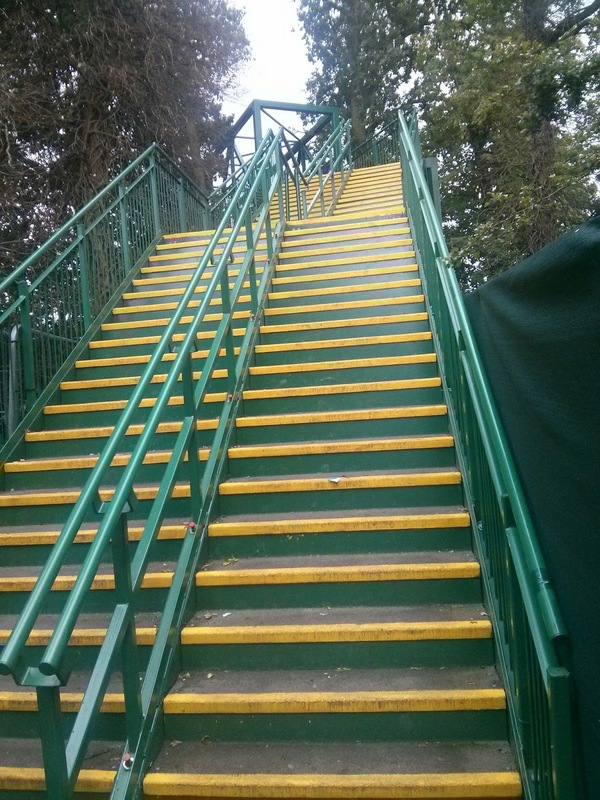 The husband promptly directed everyone to get done with the shopping in the Wimbledon store. Everything inside the store is obviously overpriced - keyrings, magnets, tshirts, towels, water-bottles, bags etc. but we went berserk shopping. Although knowing very well that you are being ripped off, its almost impossible to come out of the store empty handed, I guess this is also part of the experience. To reduce the guilt of spending enormous amount of cash in the store, the husband took us to the HSBC stall. Apparently all HSBC customers get a coupon for a free strawberry & cream bowl at any food stall on the ground. Now the husband being a veteran member of the bank suggested we avail this offer and spend some money instead on the other overpriced thing sold at Wimbledon - a glass of Pimm's. The Wimbledon experience is incomplete if you dont settle down on the Henman Hill with a bowl of strawberries&cream or pimm's. The play was resumed by now and we we were done with the touristy stuff, so we did what we actually came to Wimbledon for - we watched a few games on the outside courts. We settled down on court number 11 and watched the ladies single game of Navarro who beat Marina Erakovic. You can feel the power of the game when you watch it live. 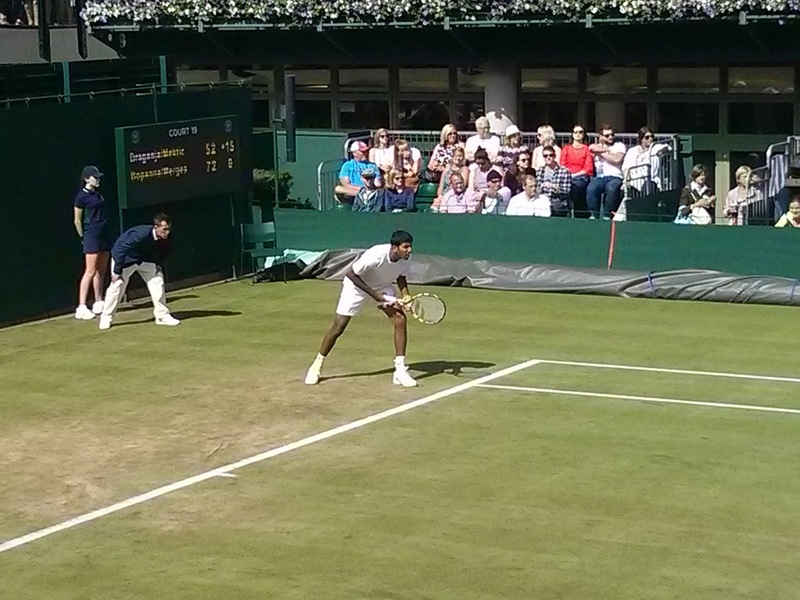 Then there was a mens double game where Rohan Bopanna was playing. Everytime Bopanna was scoring a point, POITR, Head & Thakur were shouting and cheering at the top of their voice which I think was making him really uncomfortable. While watching the game, POITR had settled down not very far from a pretty Indian lady whom he promptly tagged as Bopanna's wife. Determined to prove that he is right, POITR pulled out his phone, googled 'Rohan Bopanna wife', went to the 'Images' tab and shoved their marriage picture on our faces. Now first of all, no one looks really how they appear in their marriage pictures so there was no way to really confirm but we did not want to get embarrassed further so we accepted his analysis. Only if IT showed so much efficiency at work! 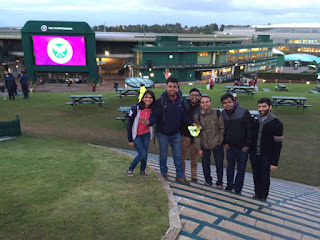 We had watched a few games by now, and we were getting restless as Federer was going to play the last game on the centre court and we were desperate to watch him play but we did not have the tickets for the centre court. Very little is known about the second queue, the resales queue that is found at the top of the complex near the Hellman Hill. This queue is to resale the tickets from people who had the show court tickets but have left the ground, and this resale money is given for charity. Prices are pretty low - in the range of 10-20 pounds. The husband was obviously well versed with the resale routine and we all paraded to line up in the queue. The resale queue was quite big as no one wanted to leave the chance of watching the man himself, Federer play on the Centre Court. We were alternating to queue up and watch some games. 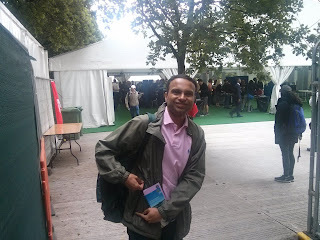 Suddenly while Gluten Free, husband and I had stepped away to watch a Leander Paes game, one of the stewards came around asking if anyone was interested in Court 1 tickets. 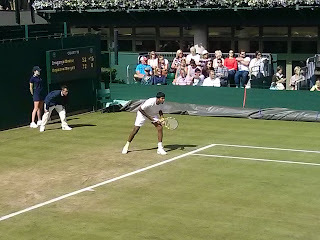 The Head made a decision and moved to the Court 1 queue and we got 6 tickets to court 1 where Djokovic was about to play. We did not get 6 tickets in the same place so we had to split 4-2. When we entered the Court 1, Venus Williams was wrapping up her victory against Daria. 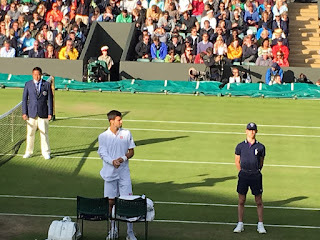 When Djokovic entered the ground, there was a huge cheer in the court. Unfortunately, it was not his day and he got off to a bad start. 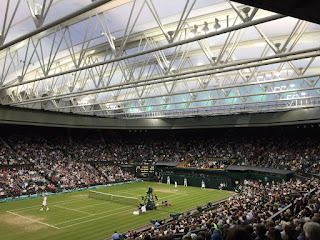 Sam Querrey's serve was nonreturnable and even djokovic's finesse could not help him win the points and he lost one game after another until he lost the first set. 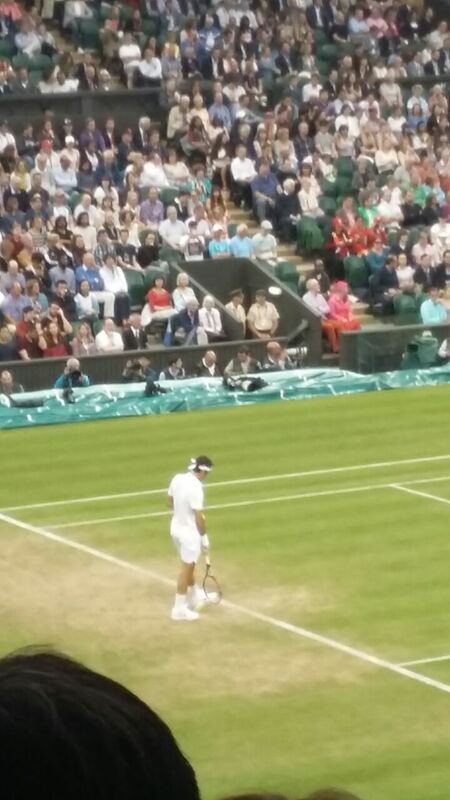 The husband was getting restless as the Federer match was drawing close and decided to step out of the Court No. 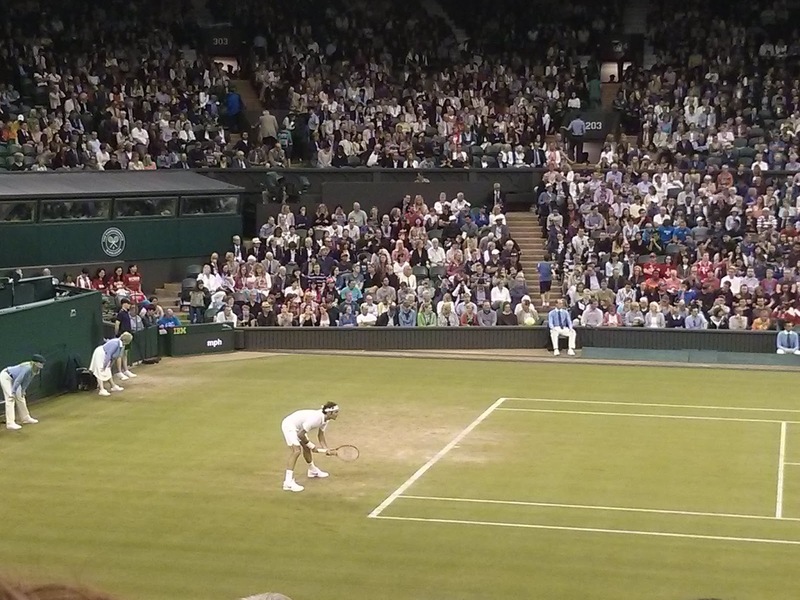 1 to give a try for the centre court tickets. After another game, Thakur decided to join him too. Djokivic had now lost another two games in the second set when the husband suddenly asks us to make a mad dash towards the resale queue. Now, no one is allowed to get up, move, come in or leave while the game is on, so we had to wait until Djokovic lost another game to Sam Querrey. We ran towards the resale queue. I cannot tell you for sure but probably due to the rain showers and frequent start and stop of play, a lot of people who probably had got in the morning had left and the resale queue had moved pretty fast since the husband had joined. We all sneaked in one by one and we could not believe that we got tickets to the centre court for a Federer game. 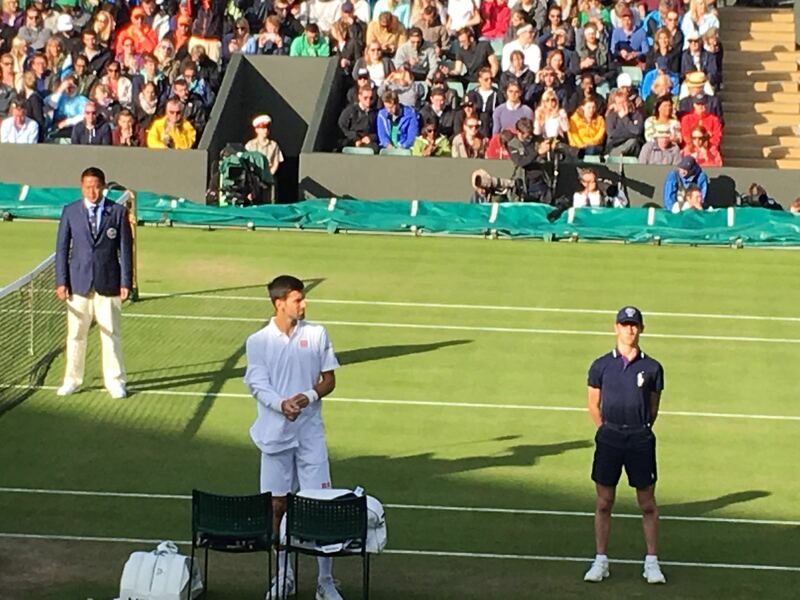 By now, the rain gods were showering their love again and Djokivic's game on Court No. 1 was suspended, what a perfect time to get out we thought ! 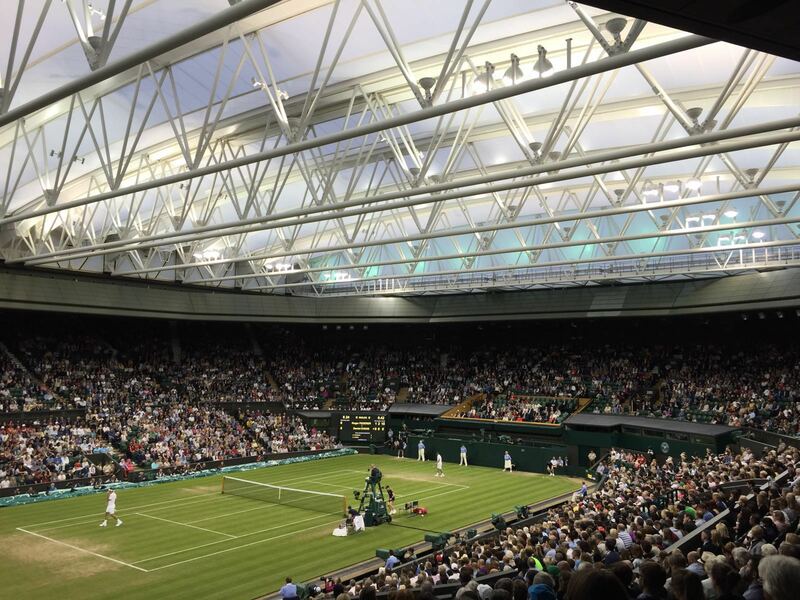 The centre court roof was on, game was set to begin and we settled down to watch Federer game. Gluten Free took out his bottle of wine and poured some for the husband in plastic cups. Two American girls sitting beside Gluten Free were throroughly impressed by his meticulous planning. While Gluten Free was busy leaving no stone unturned in impressing them further, I was engrossed in the Federer game. 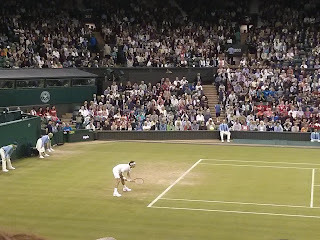 Federer's serve is top class, his forehand has power, his back hand is like a whip. His sense of speed, his reactions to the moves, his footwork, and his degree of placement is so good that it just flows effortlessly and brings out the beauty of his game. So much is said and written about his play that I need not say more. 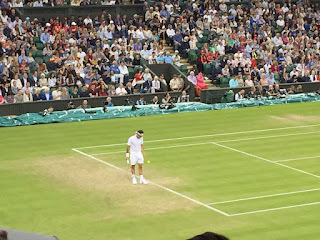 All I can say is if you haven't watched this man play live, please do, on the grass court of Wimbledon and as dramatic as it sounds, it is near religious experience. 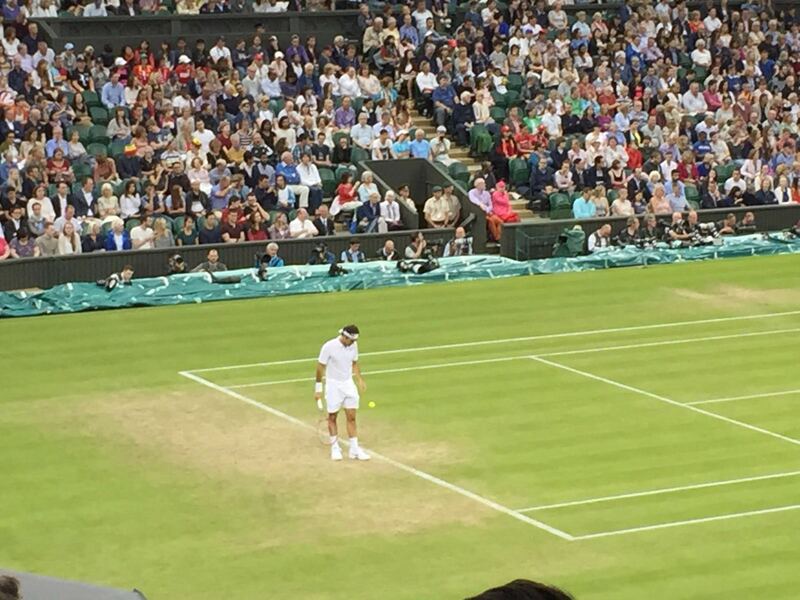 Federer eventually won the game and one item of watching Federer play live was ticked off the bucket list.